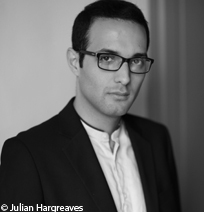 A French composer, violinist and conductor born February 25, 1989 in Toulouse. Benjamin Attahir studied at the Toulouse Conservatory, the Paris Regional Conservatory (class of Edith Canat de Chizy) and then at the main Paris Conservatory, where he followed the teaching of Marc-André Dalbavie and Gérard Pesson. A violinist by training, and a pupil of Ami Flammer, he has performed notably with the Orchestre des Lauréats du Conservatoire, the Jersey Chamber Orchestra, the Ensemble Intercontemporain. As a conductor he has premiered many contemporary works and in 2012, with Patrick Wilbart, he founded the ensemble ÆNEA dedicated to the rediscovery of the various French romantic repertories as well as the development of new works on old instruments. His fascination for the link between the contemporary world and and historic objects from the past is evident in many of his works (La Capricieuse for harpsichord, 2014; the opera La Pastorale d’Issy de 1659, 2015; Nach(t)spiel, premiered by the Orchestre National du Capitole, 2016). Drawing inspiration equally from East and West, he has composed chamber music (De l’obscurité II for harp, 2012; Takdima for oboe d’amour, trombone, piano, harp and viola, first performed by the Ensemble Intercontemporain, 2014), orchestral music (N’zah, premiered by the Orchestre National de France, 2010; Sawti'l Zaman, premiered at the Festival de Lucerne, 2013; Maâ, double concerto for violin and double bass, 2015; Al Fajr, concerto for piano and ensemble, first performed by Daniel Barenboim, 2017) and operas. In residence at the Villa Medici (2016-2017) he was able to explore his own contemporary reworking of the musical continuo with the composition of a chamber opera.